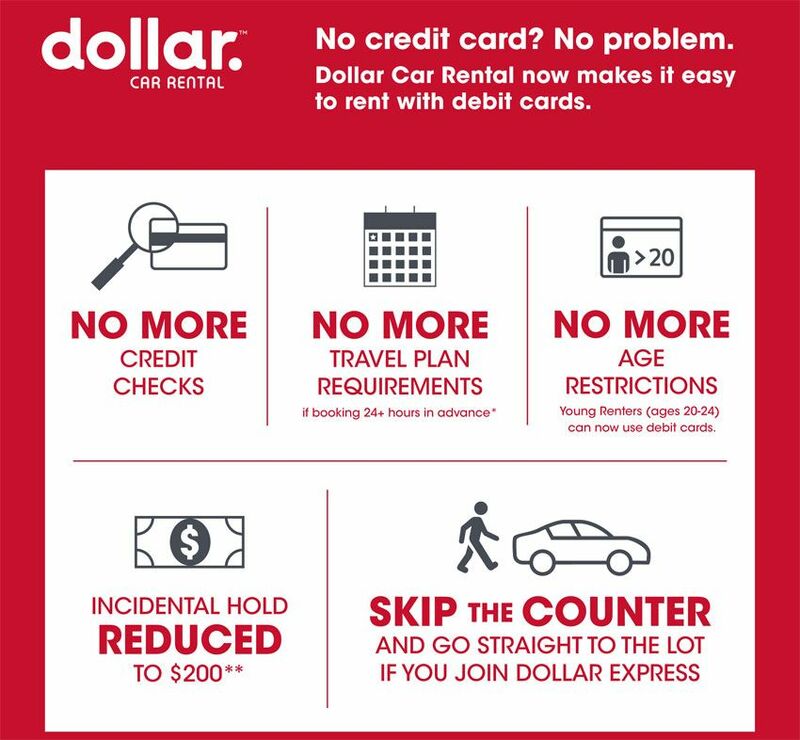 Dollar Car Rental is rolling out an industry-leading debit card policy making it easier than ever to reserve a car using a debit card. The policy will eliminate credit checks, reduce proof of return travel and ID requirements, while also lowering the renter age restriction from 25 to 20 years old. "For more than 27 years, I've been on the radio helping families win with their money, including telling people to cut up their credit cards and only use debit cards. I've also heard from a lot of callers frustrated while looking for a car rental company that would accept debit cards without all the run around," said Ramsey. "Dollar Car Rental heard the pleas and stepped up in a big way to put a system in place to accept debit cards, without all the hassle. This incredible service is going to impact a lot of people!" Rentals booked more than 24 hours in advance will only require a debit card and driver's license. Rentals booked less than 24 hours in advance, or rentals for Convertibles, Luxury and Premium vehicles, can still use a debit card but require two forms of identification and proof of return travel plans. The policy will also reduce the incidental hold amount from $350 to $200, plus the cost of the rental, for both debit card and credit card rentals. Dollar accepts all non-prepaid debit cards backed by Visa, Mastercard and Discover. "This is yet another way we can do our part to help minimize any stress when traveling, especially for our customers who choose to use a debit card," said Susan Jacobs, Senior Vice President, Global Dollar Brand. "Listening to our customers and providing a better experience is in our DNA here at Dollar, and that's why leading the industry with this big policy change is so important to us." Nearly half – approximately 44 percent – of Americans prefer debit cards according to the Federal Reserve1. Nearly a third – 29 percent – of Americans do not own a credit card2. More than half of people aged 18-50 have credit scores below 660, which would have prevented them from renting with a debit card under the former policy1. The new policy is valid at all of its company-owned locations across the U.S., and for more information on this new policy, visit www.dollar.com/ramsey.